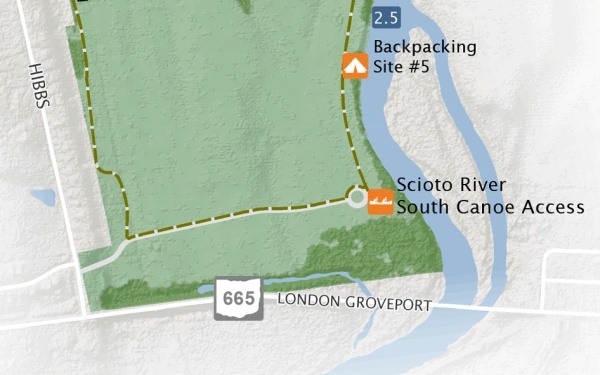 Scioto Grove is on the south side of Columbus, along the (duh!) Scioto River. 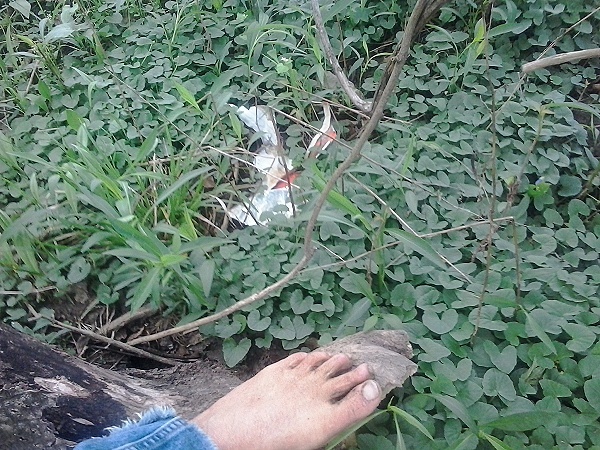 However, that location means that garbage that people of the City of Columbus manage to lose into the river can end up along the flood plain next to the river. Hence the call for volunteers to clear out what we could. Bring closed toed shoes (waterproof boots if you have them), long pants, bug spray, sunscreen, and gloves. I went anyways, figuring they’d want the help regardless. (Plus, in all my other interactions with MetroParks, my bare feet have been just fine with them—actually, as I’ve mentioned before, outdoorsy and nature types are almost always fine with bare feet.) 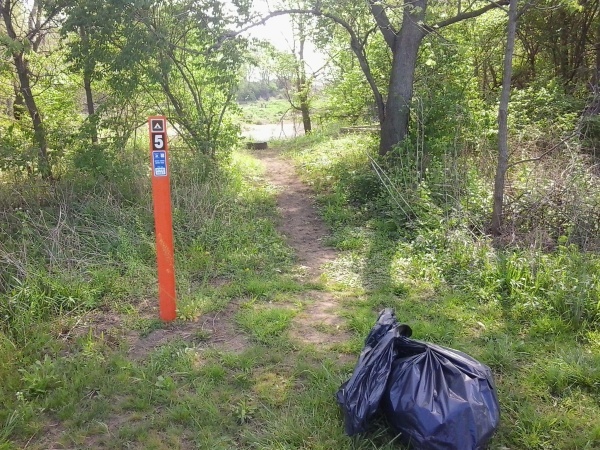 The person leading the clean-up, A.J., even remembered me from some hikes at Clear Creek. There were two other people there, Melissa and Brook. We met at the south canoe access point. I started off by working my way north. The others headed south. 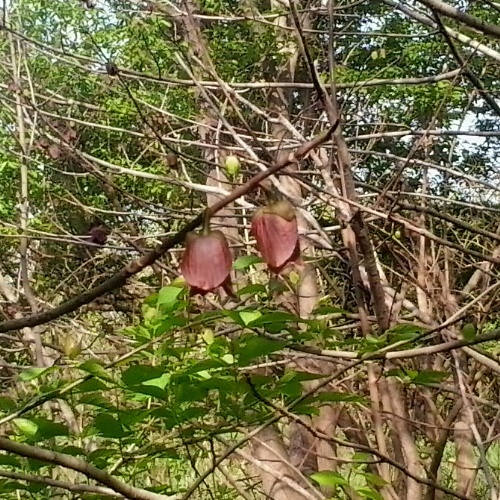 One thing we all did have to look out for was the poison ivy. It was just starting to leaf out. I wasn’t too worried about it. 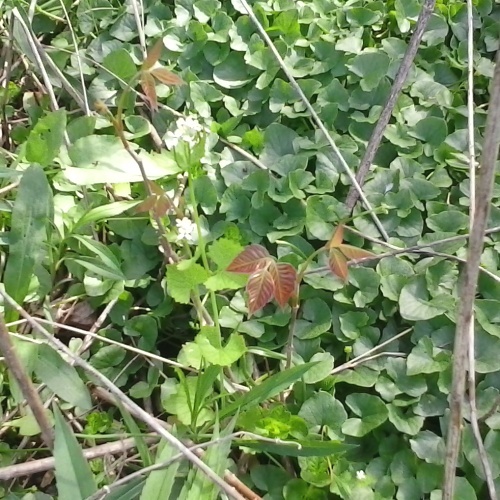 I’ve learned in the past that poison ivy really has to be bruised to release its oil, urushiol, so I just stepped around it carefully. (And bare feet are much better for not bruising poison ivy than waffle-stomper boots.) Nonetheless, after I got home I made sure to give my feet and legs a good warm-water-and-soap scrubbing to get any oils off of them. It was really a gorgeous part of the park. 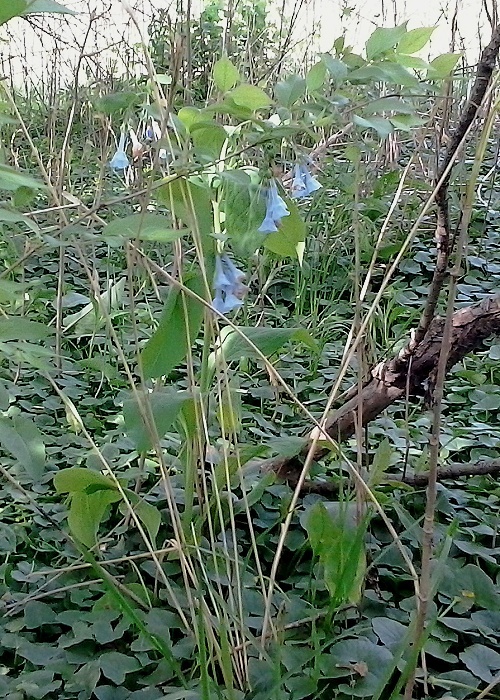 The bluebells were blooming. 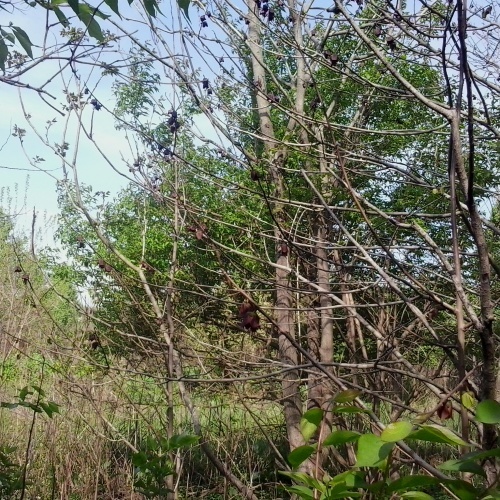 As I worked my way north, I came across a grove of trees with really pretty deep purple flowers hanging down from otherwise denuded branches. 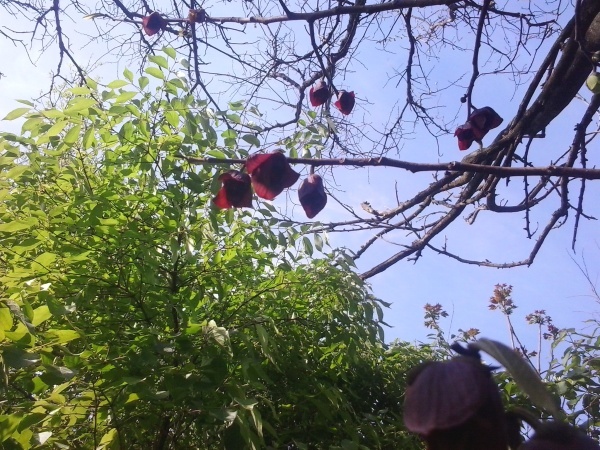 It was only after I got back to the beginning that Melissa was able to identify them for me as the flowers of pawpaw trees. Here’s one more picture I took that really shows off the deep purple as the sun works its way through them. I worked my way as far north as Backpacking Campsite #5. I did a lot of dodging around vegetation of all sorts, and even spent a bit of time at the river’s edge, if I could get there. That stretch of the Scioto (on the side I was on), has 8-10 foot bluffs, so I could only get to the water by using tree roots. Oh, and it was slippery-muddy, so I didn’t go that way if it looked like I’d either hurt myself or end up in the water. At the Backpacking Campsite I took a picture of a few other things I’d found. You may also notice all the mud on my foot. 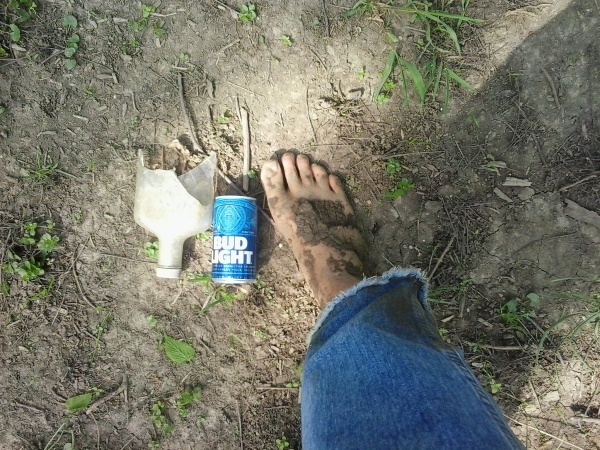 That was from when I was right along the river and stepped on ground that looked solid, but was actually 10 inch deep mud. Before we started, A. J. had mentioned that folks had actually lost shoes when that happened, but of course that was not a problem for me. I ended up collecting about half a large bag of garbage. From there I walked back along the trail to the parking lot, where I found that the other 3 had collected a huge pile of stuff. I guess downstream towards the bridge was the place to be. They’d been mining much more productive ore (including at least 3-4 tires). But I still did my part with my section. In some ways I really do own them. 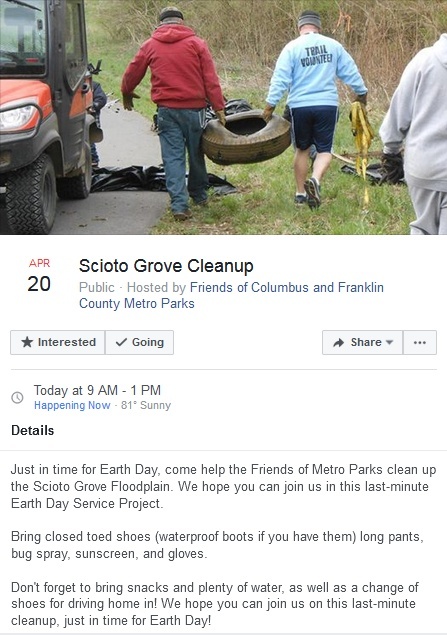 I live in Fairfield County but the taxes for the MetroParks are paid by Franklin County residents. Thus, I get to use the parks (and all of their programs) for free. This was a bit of voluntary taxation on my part.